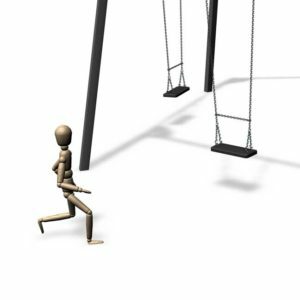 Swings on grass – can it be installed there? No: the impact attenuation of grass is normally considered to be 100 cm. Swings typically have falling height of 120 – 140 cm. (Note: In some countries -the UK for example- grass is considered to provide sufficient impact attenuation up to a height of 150 cm). Furthermore, grass wears and once there is only hard topsoil, its impact attenuation is no longer sufficient. Yes: If the grass is of good quality, its impact attenuation most likely is sufficient for a swing. Wearing is still a problem, but if the swing is not heavily used, e.g. it’s installed in a housing company’s yard, it could be enough if rubber granulate slabs are installed under each seat. NEXT: Accidents at daycare center – is the manufacturer liable?